Brooklyn 11211 › Rose Plaza Now a Conversion? Rose Plaza Now a Conversion? 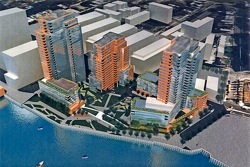 Rose Plaza: Not Coming Soon to a Waterfront Near You?? Brownstoner reports this morning that 484 Kent Avenue has a DOB permit to convert the top two floors of the building to 30 residential units. The ground floor will remain as warehouse use. Presumably, this means that the grand plans for Rose Plaza – and its 240 affordable housing units – aren’t going to come to fruition anytime soon. If that’s the case, that is the second affordable housing project in a week to put an affordable housing promise on long-term hiatus.